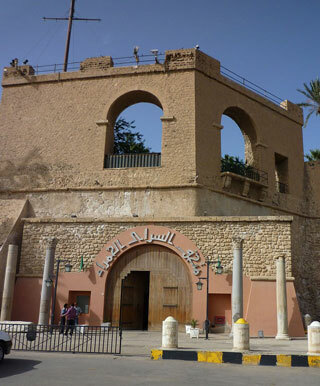 The Red Castle Museum, also known as Assaraya Alhamra Museum or the Archaeological Museum of Tripoli, is a national museum in Libya. It is located in the historic building known as the "Red Castle" or "Red Saraya". Designed in conjunction with UNESCO, the museum covers 5,000 years from prehistory to the independence revolution (1953) era. It is located in Tripoli's Assaria al-Hamra or Red Castle fortress, on the promontory above and adjacent to the old-town district with medina Ghadema. The museum has an entrance on historic As-Saha al-Kradrah, the Martyrs' Square. This article uses material from the Wikipedia article "Red Castle Museum", which is released under the Creative Commons Attribution-Share-Alike 3.0 License.